Last week we wrote about the decline in Information sector jobs. In that post we mentioned that the Information sector should not be confused with Information Technology (IT), which is experiencing solid growth. Our growing IT industry has gotten some national attention recently, including this Nov. 3 Huffington Post article. 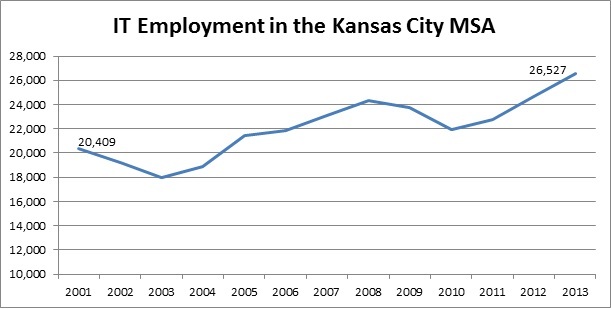 So, let’s take a closer look and see what is happening in Kansas City’s IT sector. For our purposes, we define IT as a combination of three industries: Computer System Design and Related Services; Software Publishers; and Data Processing, Hosting and Related Services. The overall trend in employment growth in IT is solidly positive. IT employment grew by 30 percent between 2001 and 2013. The largest growth was in the Computer Systems Design and Related Services industry, which added nearly 8,000 jobs (a 59 percent increase). Nationwide this sector grew by 30 percent. Software Publishing increased by a modest 9 percent, almost mirroring the 8 percent growth nationally. 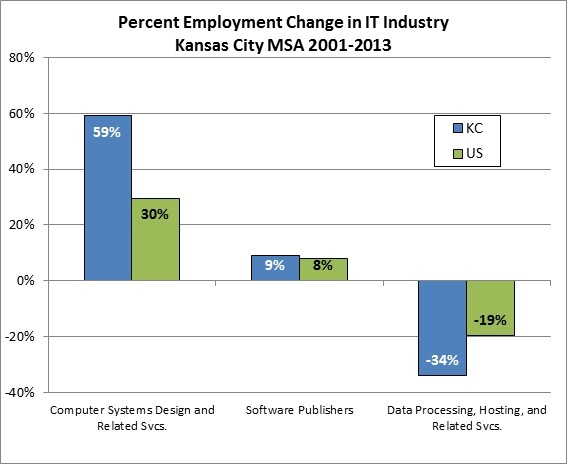 The Data Processing industry lost nearly 2,000 jobs locally (a decline of 34 percent). This sector declined nationally as well, but by only 19 percent. T at 1.54 (where 1.0 represents the national average), and this sector is growing faster here than it is nationally. There is also a great deal of IT momentum beyond the numbers. Google brought a lot of national attention to Kansas City and its IT sector when it chose to build its first high-speed fiber network here. The Crossroads District and the Kansas City Startup Village have become hotbeds for IT startups. And some of our largest, most well-established employers (such as Cerner, DST, Garmin, Perceptive Software) are growing, international leaders in Information Technology. In talking to IT companies, the same two concerns keep popping up. The first is the lack of venture capital. Venture capitalists tend to focus on the coasts, which can hamstring local entrepreneurs. The second concern has to do with workforce. While IT companies are generally satisfied with the current workforce, there is concern that the local labor market is not deep enough to meet growth needs.